of death, I fear no evil, for Thou art with me. Holy Father Patrick was born around 387 A.D. in Britain to a noble and wealthy family of Romano-British extraction. By that time, Christianity had become the official religion of the Empire, and both Patrick’s parents were Christians. His father, Calpurnius, was a cavalry officer in command of Roman soldiers stationed in western Britain to keep order. Calpurnius served as a deacon in the church. Patrick’s mother, Conchessa, was a close relative of St. Martin of Tours,1 a venerable bishop and ascetic. Young Patrick, who was called Patricius by his parents, led a happy life free of want and care. Everything changed when the boy turned sixteen. One day, Celtic slave traders stormed the villa where his family lived, kidnapped Patrick and took him by boat across the Irish Sea together with other young British men. Patrick was sold as a slave to a druid chieftain. For six years Patrick herded his master’s sheep. It is believed that he tended his flocks on the hilly north-eastern part of Ireland near present-day Belfast. In this time of severe hardship and loneliness, the love of God increased in young Patrick more and more. Every day and every night, he said hundreds of prayers. Patrick’s faith grew and gave him so much strength that he did not feel hunger, snow, frost, or rain. After six years, the youth heard a voice that said, “Behold, your ship is ready.” The voice instructed him to go to a ship that was two hundred miles away. Patrick understood the danger of the long journey: fugitive slaves, when caught, were cruelly punished by their masters. But he obeyed the will of God and safely found his way to the ship. After a difficult sea voyage, Patrick was safely restored to his home in Britain. Although St. Patrick rejoiced in reuniting with his family, he was troubled by constant visions of the Irish imploring him to return. During the years of captivity, he developed love for Ireland; the thought of people living in the darkness of idolatry saddened him. But the young man knew that, in order to become a good preacher of the Gospel, he needed to study. St. Patrick went to Gaul. There, he spent many years in an island monastery and fifteen more years as a pupil of Bishop St. Germanus. Around 430 A.D., St. Patrick was ordained a bishop and sent to Britain where, with a group of other clergymen, he preached to the people and turned them to God. Many miracles of healing accompanied the conversions. The saint was sixty years of age when he returned to Ireland to begin his incredible mission. The task of converting the Irish was full of peril. 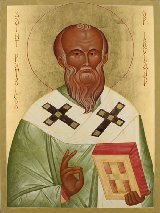 Daily, St. Patrick expected either to be killed, or robbed, or sold into slavery. His life was repeatedly threatened, but his love of humanity overcame mistrust and hostility. Bishop Patrick baptised kings, their families and thousands of common people. He also built churches, monasteries and schools all over the country. It is said that, in order to explain the Holy Trinity in a simple way, St. Patrick used the shamrock. After years of living in poverty and enduring much suffering, the Enlightener of Ireland died on March 17, 461. By the time of his death, almost the entire population was baptised. St. Patrick’s disciples continued his work. The Christian Irish stopped slave trading and never went back to it. There is a beautiful prayer written by St. Patrick containing the following verse. Christ in the ear of everyone that hears me! May Thy salvation, Lord, be always with us! Amen.